The co-existence between Blaine goaltenders Nick Malvin and Danny Harper wasn’t always peaceful. “We were competitive,” Malvin said. “Sometimes we wouldn’t get along. Sometimes we would get along. The graduation of Harper, who backstopped Blaine to three straight state Class 2A tournaments, left the Bengals’ starting goaltending duties squarely in Malvin’s blocking and catching mitts. No, there was only love for Malvin from his teammates, coaches and the massive Blaine cheering section after the junior stopped 41 shots in the No. 2-seeded Bengals’ 4-3 upset victory over No. 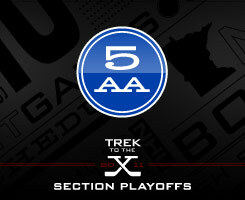 1 Maple Grove on Friday, March 4, in the Section 5AA championship at the State Fairgrounds Coliseum in St. Paul. What it took for Malvin was a breakaway save on Maple Grove’s Spencer Bell. It took rock-solid positioning on a backhand shot by Shane Wolden. It took a point-blank save on the Crimson’s Dylan Steman late in the third period. It took … well, you get the idea. So what was Malvin yelling? Turns out, nothing in particular. Malvin made 16 saves in the first period, when top-seeded Maple Grove all but dumped a puck bucket on the wiry goaltender. It was more of the same in the second and third, when the No. 4 state-ranked Crimson launched 14 shots at Malvin in each period. Malvin has played awfully well all season. He finished the regular sreason ranked fifth in the state with a .931 save percentage. He was ninth with a 1.86 goals-against average. Malvin’s most impressive stat might have been his 14-4-4 regular season record. Not bad work for a goalie on team that didn’t figure to have that much success after losing Mr. Hockey Nick Bjugstad to early graduation, Harper and several other senior standouts. With the stakes raised and pressure cranked full throttle in the section playoffs, Malvin responded by playing pretty much like he did in the regular season. In other words, he’s been lights out. Malvin had a .929 save percentage and 1.99 goals-against average in three section playoff games. “It definitely pushed me in practice over those two years,” Malvin said about playing behind Harper. And the yelling? Where did that come from? “I was just in the mood, all the intensity … I was just in the mood,” he said giving a wooooohooooo example of his on-ice vocals. “It feel great.” Malvin said. “I don’t even have any words for it right now. 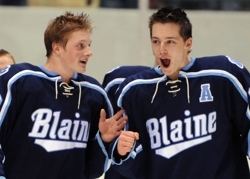 Michael Brodzinski and his Blaine teammates are accustomed to getting big goals from Michael’s older brother, Jonny. 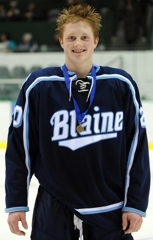 But Michael, a sophomore defenseman, tallied the two biggest goals of Blaine’s 4-3 overtime victory against Maple Grove in Friday’s Section 5AA title game at the State Fairgrounds Coliseum in St. Paul. Brodzinski’s first goal tied the game in the third period. 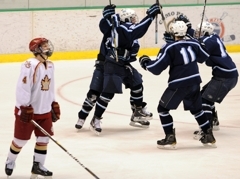 His second goal, scored in overtime, sent the Bengals to the state tournament for the sixth consecutive season. 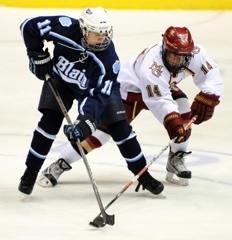 Briggs Fussy emerged as Blaine’s first hero, giving his team a 2-0 lead with goals in the first and second periods. And Malvin repeatedly shut the door on Maple Grove’s offense. The Crimson finished with a 44-27 edge in shots on goal. The first of those shots finally connected in the second period as Maple Grove defenseman Trent Bolin scored on a drive from the blue line at 11:28. Jonny Brodzinski had a chance to restore a two-goal Blaine lead late in the second period when the Bengals were awarded a penalty shot. 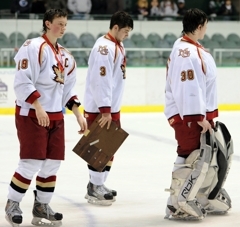 But Maple Grove goaltender Ryan Coyne made the save. A wild third period ensued, starting with a goal from Maple Grove’s Shane Wolden at 8:48 to tie the score 2-2. Blaine then drew a penalty for too many men on the ice and the Crimson capitalized with Tony Paulson’s power-play goal at 10:11. Maple Grove, which tied and beat Blaine earlier this season, took its first lead of the game at 3-2. But the Bengals remained poised. Then Michael Brodzinski lifted their spirits, knotting the game 3-3 just 29 seconds after Maple Grove went ahead. “That was a huge goal because they outplayed us for long stretches of that game,” Aus said. Just 35 seconds into the extra session, Brodzinski won it for Blaine with a power-play goal nearly identical to his first goal. “The second one went a little bit higher,” he said. 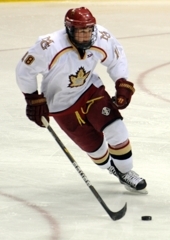 Sophomore defenseman Michael Brodzinski scored a power-play goal 35 seconds into overtime as No. 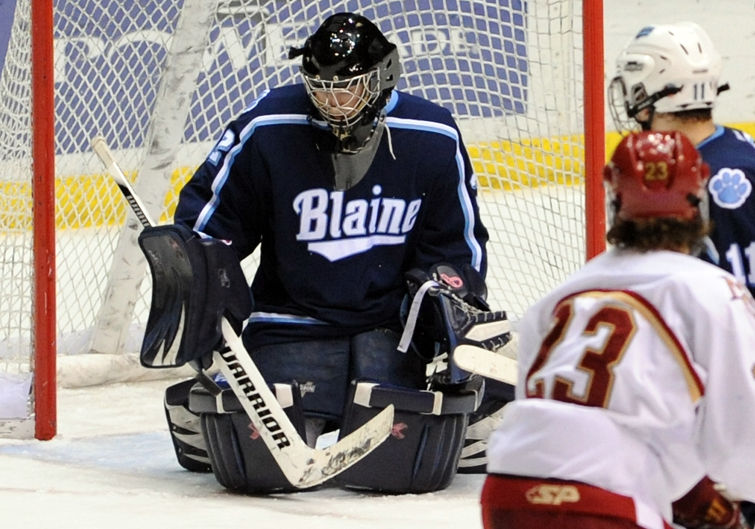 2-seeded Blaine upended top-seeded Maple Grove 4-3 on Friday, March 4, in the Section 5AA championship at the State Fairgrounds Coliseum in St. Paul. 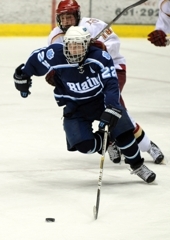 Brodzinski, who had played a forward position in Blaine’s section semifinal victory over Osseo, was moved back to defense against the Crimson. He also scored with 6:20 left in the third period to tie the score at 3 as the Bengals (20-4-4) pushed Maple Grove (22-4-2), ranked No. 4 in Class 2A, into the extra period. The victory sends the Bengals to the state tournament for the sixth consecutive season. Junior Nick Malvin turned in a stellar performance for the Bengals, stopping 41 shots. Maple Grove senior goaltender Ryan Coyne, made 22 saves, including one on a second-period penalty shot by Blaine senior Jonny Brodzinski. Maple Grove junior defenseman Drew Aspinwall was called for hooking with 1:09 left in the third period. Blaine remained on the power play in the overtime when Brodzinski scored the winner on a waist-high blast from the point. The sophomore defenseman scored to tie the game at 3 late in the third period, then one-upped himself by hammering a wrist shot through traffic just 35 seconds into overtime to give the Bengals the upset victory. Brodzinski has four goals in three playoffs games and 13 goals in all this season. If not for Brodzinski’s late heroics, the Bengals’ junior goaltender easily could have been the No. 1 star. He made 41 saves, and at least half of them were worthy of the “spectacular” stamp as Maple Grove peppered him with point-blank shots. The junior forward scored the goal that gave the Crimson a 3-2 lead and, for a short while, put them on the verge of the program’s first trip to the state tournament. Paulson and linemates Dylan Steman and Tyler Dunagan created heavy pressure in the Blaine zone for most of the game.